John B. Switzer is a professor of theology at Spring Hill College in Mobile, Alabama, where he also serves as director of the Center for Interreligious Understanding. He is former director of Graduate Programs in Theology & Ministry. He is an ordained priest of the Episcopal Diocese of Mississippi, where he serves as Ecumenical and Interreligious Officer. He also serves as vicar of St. Pierre’s Episcopal Church in Gautier, Mississippi. John studied for the priesthood on behalf of the Catholic Diocese of Biloxi until deciding against a life of obligatory celibacy. Six months prior to ordination to the transitional diaconate in Rome, Italy, he left seminary training to return to his native Mississippi. He continues to have a great love for the Catholic Church and hopes that his life can serve as an ecumenical “bridge” between the Anglican and Roman Communions. In 1988 he married the talented and energetic Patsy Webb Leaghty. Together they own and operate a small restaurant and catering business known to the locals simply as “Lagniappe.” In 2012 he was received into the Episcopal Church and the Anglican Communion. He is an oblate of the Benedictine Community of St. Joseph. John holds a BA in history and philosophy from St. Joseph Seminary College in St. Benedict, LA, an STB from the Pontifical University of St. Thomas Aquinas in Rome, Italy, an MA in religious studies from Loyola University in New Orleans, and an interdisciplinary PhD in theology and education from Boston College. The Boston Theological Institute awarded him its Certificate of International Mission and Ecumenism in recognition of his studies in the area of interreligious understanding. Among the courses he teaches to graduates and undergraduates alike are included topics such as theological methods, early Christianity, ecclesiology, Vatican II, world religions, religion and culture, and comparative theology. John has twice been recognized by Spring Hill College for his excellence in teaching. 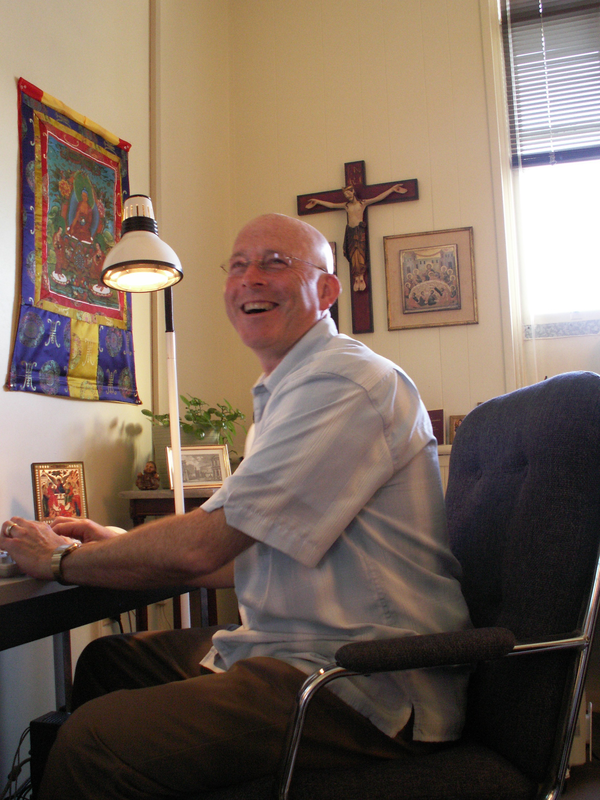 He has been a regular contributor on theological and pastoral issues for US Catholic magazine. He has two entries in the Encyclopedia of Love in World Religions (ABC-CLIO). He is a popular speaker at churches all along the Gulf Coast. He has been recognized for his interreligious work by the Mobile Masjid of al-Islam and the Atlantic Institute. All commentary on this website is the original production of John B. Switzer unless otherwise noted. It does not represent the opinion or policy of Spring Hill College, its Faculty, Staff, Board of Trustees or Students. It does not represent the authoritative teaching of either the Catholic Church, the Episcopal Church, or the Anglican Communion, although it is informed by a great deal of theological learning and pastoral experience. Photographs are believed to be in the public domain or are used with permission. If you are the owner of a photograph used on this website and proper attribution has been overlooked, please contact John immediately to have the image updated or removed. Comments and passionate debate from readers are actively encouraged. Vulgar language is not acceptable here, nor will ad hominem attacks be allowed. Comments from readers represent their own views and opinions and should not be misinterpreted as necessarily implying any agreement by the owner of this blog. Correspondence to John may be directed through the following email address: jswitzer@shc.edu. Yes, Tom … you found me! This is the theology blog. The political blog is http://www.TheLibertyProfessor.com.